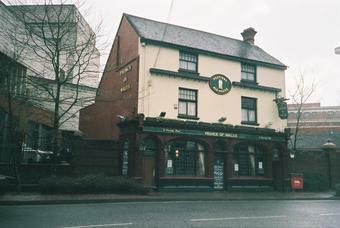 Very good pub tucked away behind the ICC. I often pop in here after work at the Barclay Card Arena. 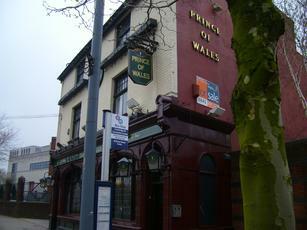 Traditional boozer and always a warm welcom. Gets quite crowded at weekend evenings. It's okay. Nothing special and a bit more variety in the Duchard/Purity/Black Sheep etc choice would have been welcomed but it seemed a friendly enough pub with a few regulars dotted around on a late afternoon. It's certainly better than anywhere else in the vicinity of the hell-hole that is Broad Street. It`s a trad looking pub in the shadow of a very large concrete convention centre. Haven`t been in here for years..not since the Flapper and Firkin days across the road. Well it`s a tidy little boozer, nice ambience, nice beer at a reasonable price, special cheapy food menu and friendly service. It`s not a total mission to get to really, 15 mins walk from Snow Hiil Station with a goodly few pubs on the way...worth a punt. Called in last week and got a surprise. No longer a traditional style pub the Prince of Wales has been gentrified to look like any other pub in any other city centre. A shame as the charm of the place was always in its traditional pub style, which you don't get much in Birmingham anymore, or pretty much at all now this place has been done up. Very good selection of beers were on offer though as always which was good. Place was about half full on a week night. We would have stayed longer but the place was freezing, couldn't take our coats off and saw a couple of people with their hats on too, so we headed off for warmer climbs. Have to say I don't think I'd go out of my way to go there again after doing so last week. A period remnant, among the mixture of post-modern and brutalist development in the area, and very welcome as such. Good range of real ales and hearty lunches when I've been there. The friendly, unpretentious local clientele mixes easily with overspill from conferences and events nearby. I thought the interior was comfortably lived-in.